Your favorite local "all-around great bbq sauce on just about anything" is coming back at you with something a bit spicier. While leveling in at Medium on the hot scale Ogre Sauce HOT is an approachable flavor for most anyone. Made with the most popular ingredients like vinegar, mustard, honey, salt & pepper as in their original, they surprise you at the end with the very last ingredient, the Carolina Reaper. If you are unfamiliar with this pepper please know that it is no joke, coming in at number one for Worlds Hottest Pepper. Luckily for us it is the smallest dose and if I can handle it, so can you. Once again they are back to get support from their fans to help get Ogre Sauce HOT on the market and in your hands. Once it's produced and distributed you'll be able to find it at Reid's Fine Foods, Whole Foods Market, Blackhawk Hardware, The People's Market, Earl's Grocery, and Provisions Waxhaw. Right now you can sample it at Tijuana Flats restaurants on their hot sauce bar; located in Ballantyne, University, and Concord Mills. They have exceeded their goal of $6,000 and currently have over $10,000 people pledged which is from roughly 365 people. Click here to get pledge yours! 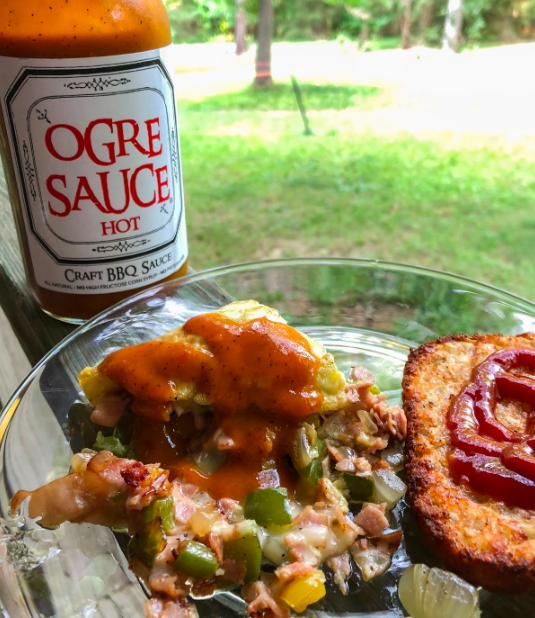 My boyfriend and I love to cook at home and he is somewhat of a hot sauce collector so we were thrilled to be given the opportunity to test out the new Ogre Sauce HOT. This version of Ogre Sauce has the same sweet tangy flavor as the original but with a slight punch at the end making you want to see what else you can try it with. Breakfast is one of our favorite meals and we look forward to it every weekend, and when the off chance comes that we work from home. For us, eggs and veggies are a staple for breakfast and with it we'll have sausage or bacon and the occasional hashbrown cake. We chose to pair the Ogre Sauce HOT with a ham, cheese and vegetable omelette. Sautéing the veggies first with salt & pepper is key, then throw in the meat to give that a bit of a sear. I typically like to drizzle Valentina hot sauce on my eggs along with some sour cream but since we had the Ogre Sauce HOT I had the chance to try a new variation. I was thoroughly pleased. Overall I have put Ogre Sauce HOT on chicken twice, eggs three times and ready to try it on some pork chops, wings or maybe even some salmon. I highly recommend giving this sauce a shot because it deserves a special place in your refrigerator as a super versatile hot sauce. A big thank you to Chris and his team for letting me try their new hot sauce. Wishing them all the luck in their kickstarter to bring this sauce to more stores near you. We made our pledge, have you?